While I was in LA for the Pom Wonderful trip, we had a beautiful pomegranate themed dinner at Tavern. In particular, I loved the farro salad with vegetables and pomegranate salsa. While I would never call myself a vegetarian, I tend to eat and cook a lot of vegetarian food. I am always looking for new ways to make hearty vegetable based meals. When I got my Crop Share this week, it had lots of carrots and parsnips in it so it was the perfect time to try to recreate this dish. While I only had my memory to work from, I think that I did a pretty good job recreating this salad. I love farro, and if you have not had it, this is a great introduction. 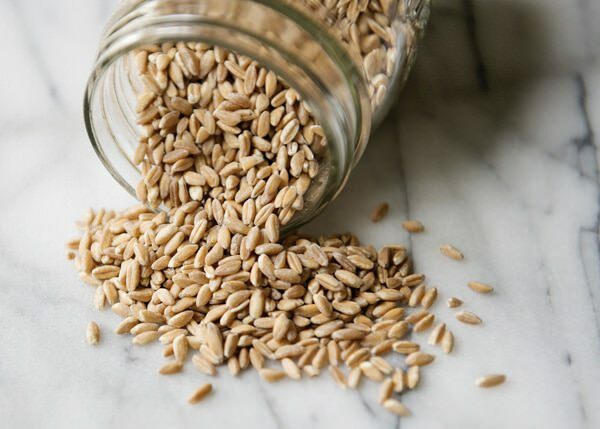 Farro is an ancient grain and used a lot in Italian cooking. It cooks in the same way as rice, but takes a little bit longer. At Tavern, this was served with squab, so if you wanted, you could add chicken or even fish for some extra protein. 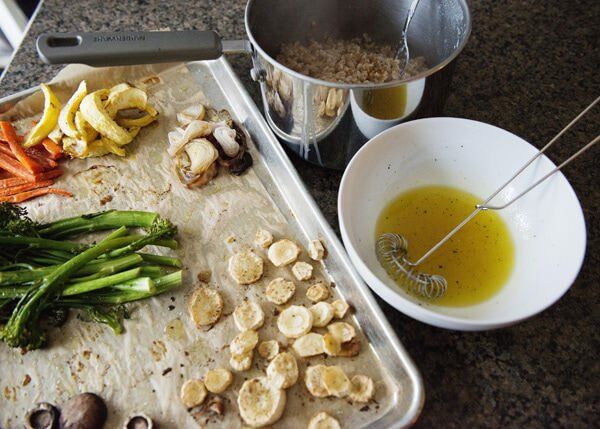 Line a baking sheet with parchment or aluminum foil. Lay all of the vegetables out in a single layer (I add the mushrooms about halfway through) and drizzle with olive oil, salt and pepper. Bake in a 400 degree oven for about 20 minutes. Take the broccolini off of the pan and put on a plate. 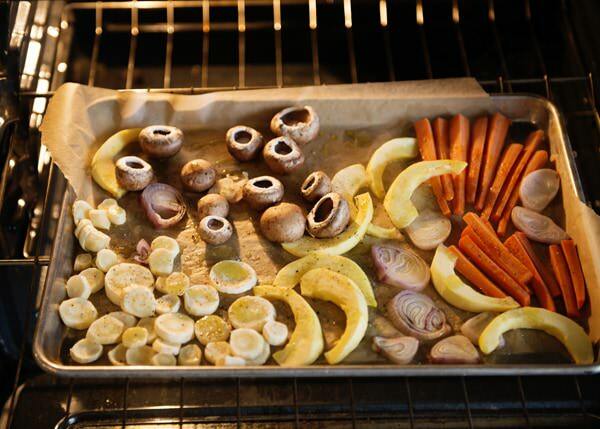 Add the mushrooms and bake for 20 minutes more, or until the vegetables are tender. This is farro. Rinse 1 cup of farro under cold water. Add to a saucepan and cover with 2 1/2 cups water. Bring to a boil and add a lid. Reduce heat to a simmer and cook for 20 to 30 minutes. Fluff with a fork. Make the dressing by whisking lemon juice, honey, salt and pepper. 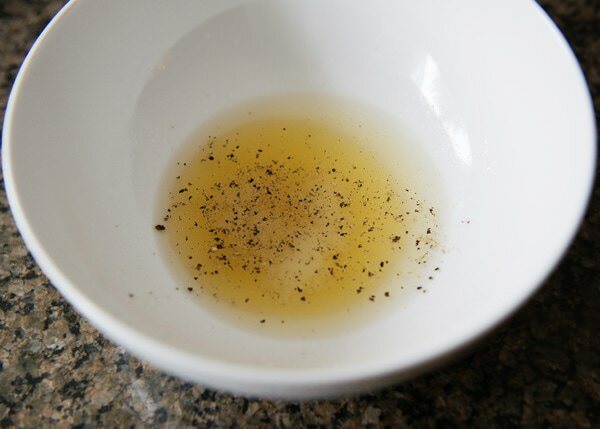 Drizzle olive oil slowly while whisking. 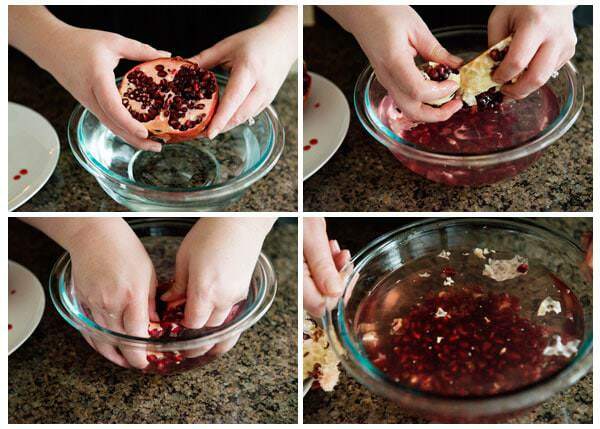 Here is the easiest (and least messy) way that I have found to peel a pomegranate. Slice a pom in half. Submerge in a bowl water. Pull the arils out of the skin while underwater. The seeds will fall to the bottom and the fibers will rise to the top. Put the arils into a container and set aside. Now you have all the pieces. Pour half of the dressing into the farro and toss to coat. Top with vegetables and drizzle the remaining dressing over. Sprinkle with pomegranate and chopped parsley. 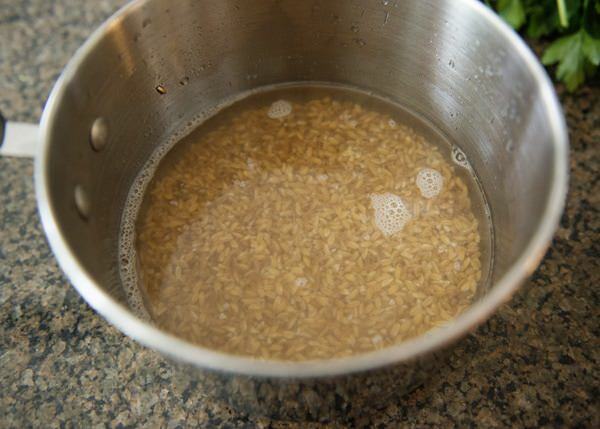 Rinse 1 cup of farro under cold water. Add to a saucepan and cover with 2 1/2 cups water. Bring to a boil and add a lid. Reduce heat to a simmer and cook for 20 to 30 minutes. Fluff with a fork. Make the dressing by whisking lemon juice, honey, salt and pepper. 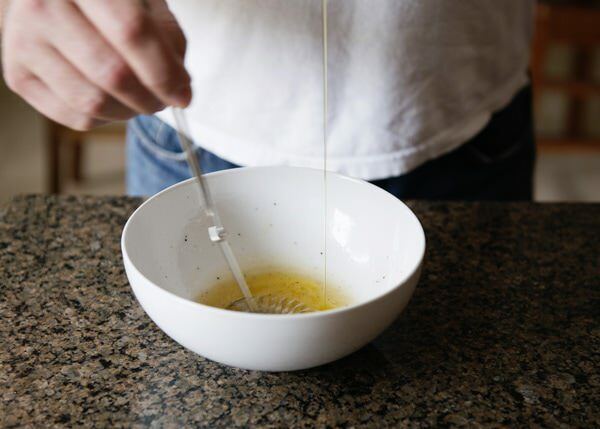 Drizzle olive oil slowly while whisking. 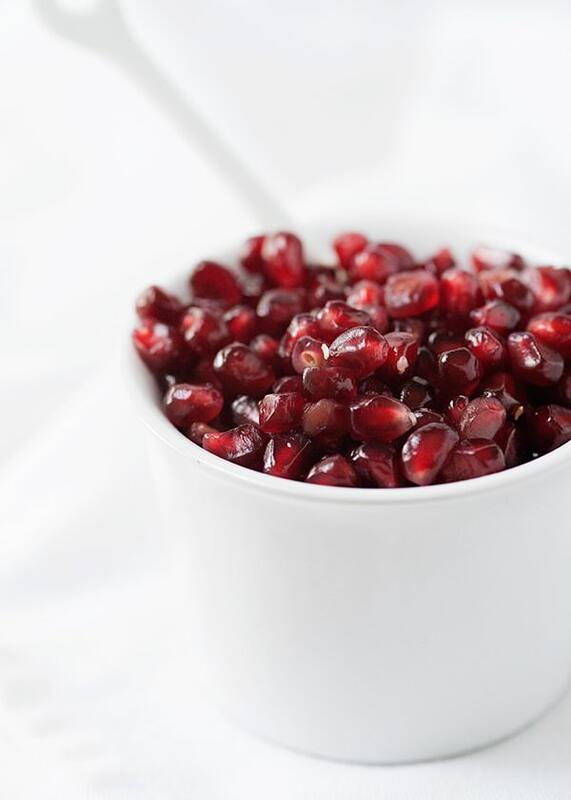 Peel the pomegranate and put the arils into a container and set aside. Pour half of the dressing into the farro and toss to coat. Top with vegetables and drizzle the remaining dressing over. 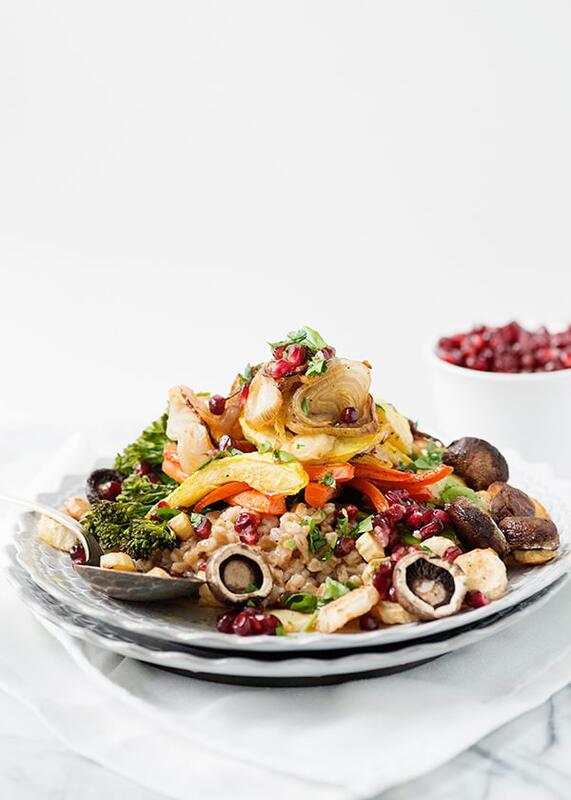 Sprinkle with pomegranate and chopped parsley. Bree, this salad is gorgeous! love, love, love! Thank you so much Katrina! I love how hearty this one is. This looks gorgeous! I’m so jealous of the fact you are getting a crop share right now. I can only dream of it and will have to wait until the end of June! ps- the site looks great! I love how it’s still the “baked bree” that we’ve all come to love, only better! I love my crop share! And I am glad that you like the revamp, it is so much more functional! This is stunning! 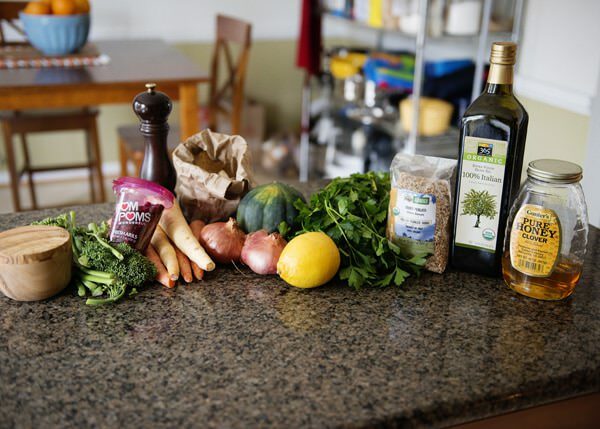 I love all these vegetables and what a great idea to toss it in a farro salad. I will definitely be making this soon! ps~ I finally watched Downton Abbey after you recently spoke about it. I’m hooked now! Love that series! Ha! I am so glad that you like Downton! I got hooked quickly too! Me too! This salad is a meal for sure! 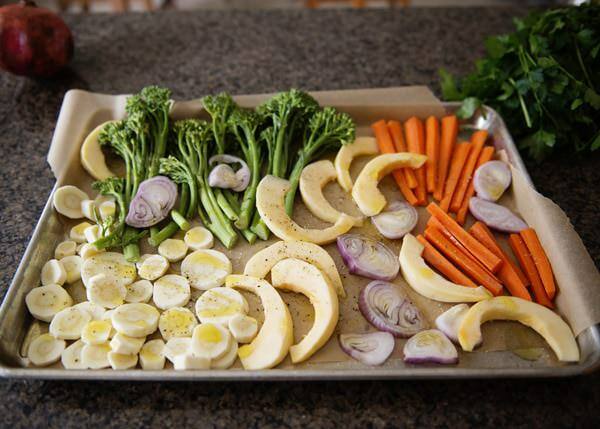 I love love love roasting vegetables, and I also love simple lemon/honey dressings like the one you used. I haven’t had much farro, but this looks delicious! You will love farro! It is nutty and I am really loving it these days. Bree, this just came up in my RSS feed. OMG – amazing shot! I am a fan farro as well as roasted root veggies. Cannot wait to make this for dinner!! Oh thank you Denise! This just made my day. This is gorgeous – and I can’t get over how incredibly gorgeous your new site is. Love it so much! 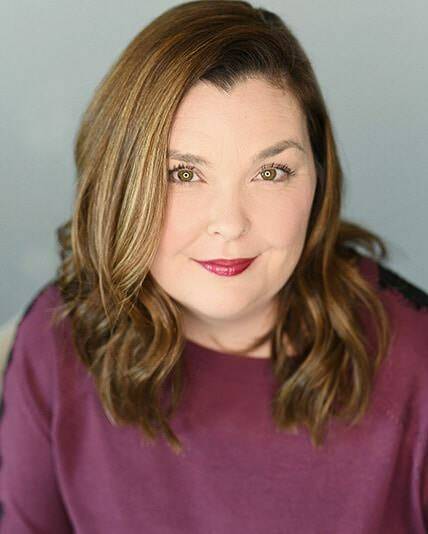 Thank you Kristen! I love it so much, I get excited every time I see it. This salad looks delicious! I can’t wait to try it. Great site. Great shots! Glad I came across it! 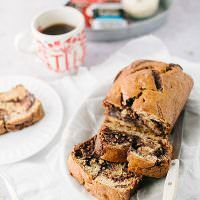 I am going to try out this recipe this week. About how many would you say this would serve? I LOVED this recipe. 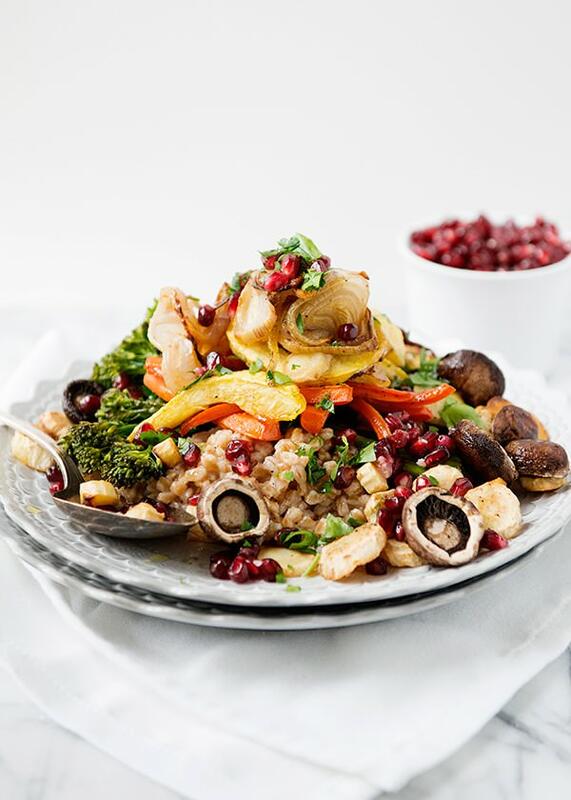 What a great and healthy meal for using up CSA veggies, and the pomegranate was the perfect finishing touch. I am so glad! I used my basket for this too! Love my Crop Share!